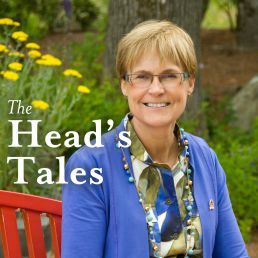 Home > News > The Head's Tales > The Head’s Tales: Who Are You? At St. Margaret’s, we pride ourselves in helping each girl find her own voice and use it in a way that helps the collective good. Last week was a perfect example of how a group of girls, with the support of their drama teacher and mentor, Jane Leavitt, was able to share that collective voice to address an issue that gets played out every day in schools, at home, and in the community. This year’s drama production utilized a Canadian theatre form known as the “Collective Creation.” In its most common application, collective creation refers to the technique of creating a play as a group, without the aid of a playwright. Every actor participates in the entire production process: from researching the theme; developing the plot, the dialogue and characters; directing and staging the production (including sound, lighting, and costume design); to acting in the play itself! Advocates of this process claim that it allows a group of artists to combine their energies and skills to collectively create original theatre that is authentic and intimately connects the actors with their audience. This past term in drama, the girls decided to create a play that explored the theme, Who Are You?—which ultimately became their title. The production included a series of vignettes that was comprised of dramatic scenes, songs, dances, poems, and monologues that explored how social media and the “mean girl”/popularity syndrome negatively impacts friendships and an individual’s self-esteem. Opening Night was set specifically for Pink Shirt Day, February 22, a national anti-bullying event that started when two students —David Shepherd and Travis Price—saw a student being bullied in their high school in Nova Scotia and supported the student by getting everyone at school to wear pink in support of him. What resonated most with me about this particular drama production was recognizing the authority of our girls’ voices on how to combat bullying: making people aware of how it can play out, encouraging bystanders to step in, acknowledging the importance of showing empathy for the victims, realizing the differences between intention and actions, and, finally, understanding that we are all human beings with more in common than we are different – even their definition of race and culture was inspiring. Reducing the audience that a bully craves – Distract and Diffuse! Mobilizing the compassion of bystanders to step in and stop the bullying – Become Upstanders! Supporting the victim and reducing the trauma – Befriend a Victim! Being aware of those elements that support a school culture of caring and nurture them – Unity and Community! Being a positive influence by making it clear to others that bullying (in all of its forms) is NOT OKAY – Speak Out and Stand Up! And all her fans agree. For deep inside she felt no immunity. Or if she has enough admirers. Education and self-respect; That’s not what she desires. And covers her rotting soul with some perfume. An inescapable vicious cycle; her battleground. Honestly, if you ask us, she’s all child’s play. Yet she has not experienced genuine care; as if she needs that anyway. She has no space to breathe, will she endure? Let’s find out how long will she last till cured. Corner her in the spotlight therefore to go she has nowhere. Oh horror! It was something she could prevent. Picture perfect life is what she dreamt. But chances for that is: one percent. But forward we go on our Fame Migration. So… for those who went to the performance, I know you would agree that our girls were awesome; for those who did not attend, I know you would be proud of the message these girls shared with the audience.